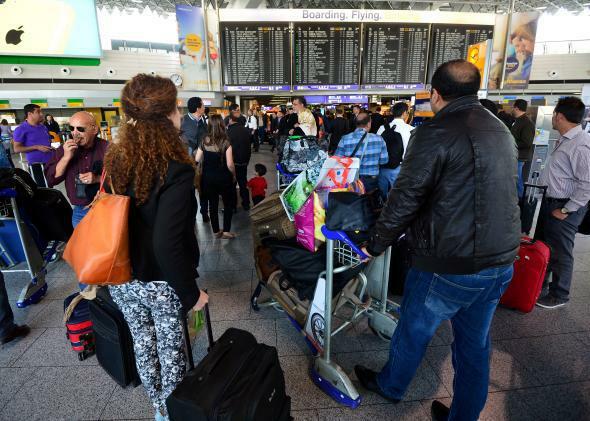 Passangers look at an airline departure board full of canceled flights on April 2, 2014, in Frankfurt, Germany. Pull out your cellphone as soon as it becomes clear that your flight is significantly delayed, even if it is not yet officially canceled. Call your airline and ask to rebook. And don’t forget to nail down your seat assignment while you have an agent on the phone. The airline will not charge you a change fee, and by calling in quickly you will have a better chance of getting a decent seat on a desirable alternate flight. Flights are so crowded these days that relatively few aisle and window seats will be available, so confirm your seat assignment if you can. This is the No. 1 most important thing you can do, and it has worked for me countless times. A year or two ago I was flying from the Washington, D.C., area to Portland, Oregon, via Denver, and my first segment out of Dulles was delayed for mechanical issues. I had a first-class upgrade on the aisle and was comfortably settled, so I was reluctant to give up that seat, but I was at risk of missing my connection, and I really needed to be in Portland the next day. I called United, and the agent booked me into the last available first-class seat on its Dulles–Portland nonstop, which was scheduled to depart an hour later but would still arrive in Portland before my original flight did (and which I had not originally booked because it would have added $150 to my fare). I gathered up my belongings, put my shoes back on, and hauled down to the other gate, where I boarded the nonstop and had a pleasant and uneventful ride back to Portland. If the flight is canceled due to weather or air traffic control issues, the airline under U.S. law does not owe you a hotel room, a meal voucher, or any other accommodation. If the flight is canceled due to the airline’s own equipment troubles, then the airline does owe you some form of accommodation, depending upon the nature and duration of the delay. If the airline is responsible for a delay of a few hours, you’ll get a meal voucher. If the airline is responsible for an overnight delay, it will give you a hotel voucher and tell you where you are staying. By now if you followed my first piece of advice, you already know when you are scheduled to fly out in the morning. When you get to the hotel there will be a large number of delayed passengers all trying to check in at the same time. Try to sit near the front of the hotel shuttle bus for that reason, to get off the bus and up to the front desk faster. While you are checking in, ask if you need a reservation to catch the hotel shuttle back to the airport for your morning flight. If you do, book it right then and there, or you run the risk of not being able to take the shuttle when you need to. You can also ask if you are eligible to earn points in your hotel loyalty program. Sometimes the answer will be yes. Have your membership numbers stored in your phone so you can handle this quickly so you don’t anger the passengers waiting in line behind you. By way of prevention, I always avoid connections through Chicago in the late fall, winter, and early spring if I can. I can’t tell you how many nights I have spent at the O’Hare Hilton or other area hotels, even though such stays have never been part of my travel plans. If you are delayed at O’Hare and there is bad weather that you think will ground you overnight (snow, lightning, etc. ), call the O’Hare Hilton first thing and ask about availability for that night. The Hilton is connected to the main terminal by underground tunnel, so you can get there without having to brave the elements. It is a good-sized hotel, but on a really bad night it will sell out completely, and then you will have to stay at another hotel, which will require you to go out into the weather and catch a shuttle bus that may or may not arrive in any kind of timely way. Keep your sense of humor and perspective. You will need both. With very few exceptions a delayed trip is not ultimately a really big deal, even if it seems to be of huge importance in the moment. It’s not your fault, and even if something big is happening on the other end of your journey, no one will hold it against you. For your sanity’s sake, try to take the inconvenience in stride. For me, knowing that I have plenty of Kindle books and magazines to read makes me feel much better. If you have only carry-on bags, you will be in a better situation, but I check bags all the time, and it is not a big deal. In my carry-on I make a point of having pajamas, a change of clothes plus an extra T-shirt or two, maybe some extra socks and underwear, and the basic toiletries I need to get through an overnight stay (basically, my plastic bag of liquids and gels, plus a stick deodorant and toothbrush), in addition to laptop and other essential electronics like charging cables for laptop, phone, iPad, Kindle, etc., and any medication I may need. Do not count on having access to your checked bag during a delay or after a cancellation, but most airlines, especially the legacy carriers, will give you an amenity kit. Just go to the airline’s baggage service office (typically on the perimeter of the baggage claim area), tell them you are delayed overnight, and ask politely. The amenity kit is a little nylon bag of goodies normally given to business or first-class passengers on intercontinental routes and may contain some or all of the following: a tiny toothpaste tube, toothbrush, lip balm, sleep mask, mints, foam earplugs, maybe a little tube of skin lotion. When you are returning the next day for your rebooked flight, if you can print out your boarding pass at your hotel, or carry it in your phone, do that—you can avoid massive queues at the airport by doing so. And last but by no means least, be nice to all the reservationists, gate agents, and flight attendants. They have the ability to help you, and they are only human. If you are nice to them, they will go out of their way to help you. In any event, the problem is not their fault, and it’s terribly inappropriate to take out your frustration on them. Travel Hacks: What are common items that savvy travelers bring with them that less-savvy ones don’t? Air Travel: Can a passenger ever go into a cockpit? Travel: What is it like to quit your job, get a backpack and travel the world?